Sticking to a grocery budget doesn't mean that one has to skimp on flavor, nutrition, or toe-curling comfort food. 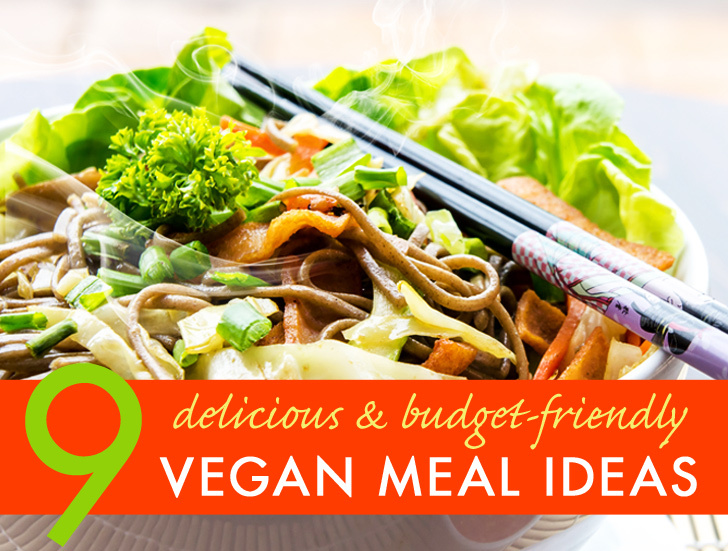 These 9 plant-based dishes are budget-friendly, super-delicious, and easy to put together too. From warming soups to lunch-able fare, these meals are as tasty as they are packed with nutrition. The best part is that most of them pull double duty as well: if you make just a little bit extra, you're also set for breakfast or lunch the next day! This is a great way to get an energy burst of protein first thing in the morning, and the amounts listed here will serve 2 hearty eaters. Feel free to halve the amounts if you’re just cooking for yourself. You can also add half a teaspoon of turmeric if you’d like your tofu a bit yellowy, and feel free to add a tablespoon or more of nutritional yeast for “cheesiness”. Toss the drained, crumbled tofu with the spices and soy sauce, and set aside. Heat your oil on medium-high, and sautee the onions and peppers together for 3 or 4 minutes. Add the tofu, turn the heat down to low, and continue cooking until the onions are golden/translucent and the peppers are soft. Season with salt and pepper to taste. (I also add tabasco or other hot sauce, but I like everything to be a little on the spicy side.) Warm your tortillas or pitas, fill with this mixture, and devour while warm. These are great with Daiya shreds, salsa, cubed avocado, fried potato, and shredded lettuce as well, so don’t hesitate to add those as well if you have them on hand. Put a layer of your favorite grain at the bottom of your bowl (if desired—you can leave that out if you’d prefer), and then add in layers of whatever you like best. You can then either dig in to get deliciousness on every forkful, or toss it all together for a big messy bowl of scrumptiousness. Puree all of these together in a blender, adjust the salt and pepper to taste, and then pour over your favorite pasta. If you like, toss in some halved cherry tomatoes, shredded spinach, or even 1/2 a cup of canned white beans that you’ve rinsed and drained. This is as great on gnocchi as it is on penne or linguini, and is amazing both hot and cold. Spicy pancakes with black beans and veggies in them? Yes, please! Add all ingredients but olive oil together, and use a potato masher to crush the beans slightly. Let sit for about 5 minutes, and adjust the flour/pancake mix as needed (it should be neither too liquidy, nor too thick. If you need to thin it out a bit, add water or more non-dairy milk). Heat a teaspoon or so of oil in a large, non-stick skillet, and once it starts hissing and spitting like an angry ferret, turn the heat down to medium and drop the batter in by the spoonful. I like to make this 1/4 cup at a time so they’re bite-sized, but make whatever size you like. Cook until they’re nice and brown on both sides, and serve hot. They’re great on their own, or topped with vegan sour cream or guacamole. *Note: I actually like to add a bit of chopped mango to my batter instead of corn for sweetness, and then increase the spiciness with a bit of chopped chipotle. If there’s a Chinatown in your area and you haven’t yet availed yourself of the amazing foods available there, go acquaint yourself with it as soon as humanly possible. You can often find treasures like bunches of watercress or huge packages of bean sprouts or tofu for half of what standard grocery stores charge, and the produce will likely be fresher as well. To make this dish, just pick up one standard package of vegetable or mushroom ramen noodle soup per person, a package of semi-firm tofu, and an assortment of vegetables. Prepare the ramen according to the instructions on the package, and about a minute before it’s fully cooked, toss in a big handful of veggies. 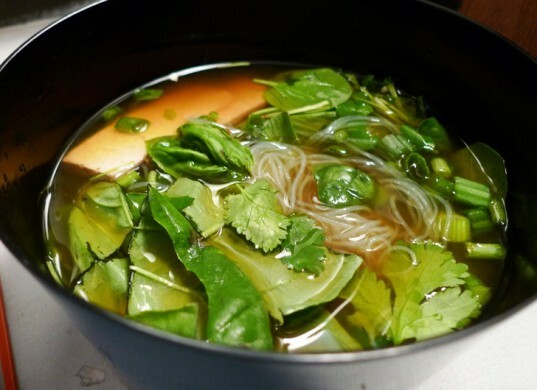 Broccoli, shredded napa cabbage, bean sprouts and watercress all work well, and add extra flavor as well as nutritional value. Serve with some fried tofu or seitan slices, and dig in! However you choose to spell this, it’s a delicious, nourishing dish that only costs a few pennies per serving. Some recipes are fairly complex, but the simplest version just uses 6 ingredients. We always make a little bit more than we expect to eat for dinner so we can fry the leftovers as patties the next morning. *Tip: If you buy rice and dry lentils in bulk, you can save an insane amount of money on your grocery bills. Heat the olive oil in a large skillet on medium-high, and add the sliced onions. Turn the heat down to medium and stir constantly until the onions are soft, brown, and slightly caramelized. Remove half the onions and spread on paper towels to absorb the extra oil. Add the the lentils, salt, a bit of extra oil, and the water (or stock) to the skillet with the remaining onions in it, and turn the heat up until the mixture boils, stirring occasionally. Add the rice, and once it comes up to a rolling boil, turn the heat down to low until the rice is cooked through and the lentils are tender. Remove from the heat, stir in the onions that you removed earlier, and season with salt and pepper as desired. 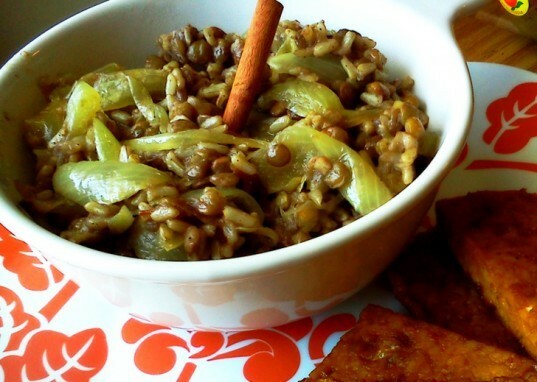 This is great with a side salad or small bowl of lemony vegetable soup to cut the rich sweetness of the onions and lentils. Also, if you have any left over, use it for breakfast the next morning: just pack it into patties, dredge in potato or chick pea flour, and fry ’til crispy. I tend to sautee the onions and peppers in a bit of olive oil before adding the rest of the veggies and stock, but it’s entirely your call. Spices like cumin, garlic powder, cinnamon, cayenne pepper, and even garam masala can work beautifully in here, so use amounts that best suit your tastes. Season with salt and a splash of lemon or lime juice, and finish the stew by adding a handful of raisins, a couple of spoonfuls of nut butter, and if desired, a splash of coconut milk. Let this sit on the warmed stove—with the heat turned off—for 5-10 minutes to give the raisins time to plump up, and then serve. You can have this with rice or quinoa, or just on its own. It’s absolutely divine, and even better for lunch the next day. Remember how we talked about Chinatown earlier? Chances are you can find some ingredients for Japanese cuisine there as well. A large bag of glutinous “sticky” rice will last you a long time, and with a few simple staples, you can create some fabulous onigiri meals. Just cook the rice according to the directions on the bag, and then determine what kind of filling you’d like in yours. If you like salty/sour tastes, you can use pickled radish or umeboshi plums, but don’t worry about sticking to traditional fillings: feel free to experiment and decide what you like best. Although a little unorthodox, my favorite fillings are wakame salad (pickled shredded seaweed), tempura fried shredded sweet potato with vegan mayonnaise (sounds weird, but it’s amazing), avocado, and spicy tofu cubes with chopped green onion. This filling is set aside until your rice is ready, and then all you do is make a patty of rice, hold it in one palm, make a small hollow in it, add a heaping tablespoon (or two) of filling, and then roll/pack it into a shape. The easiest shapes to make onigiri in are balls or triangles, and you can either leave them as plain rice, or wrap them in nori. The former technique is great if you’re eating them immediately, while the nori-wrapped ones are easier to take with you to work or school. If you’re so inclined, pair these with some miso soup (easily portable in a thermos) to round out a full meal. 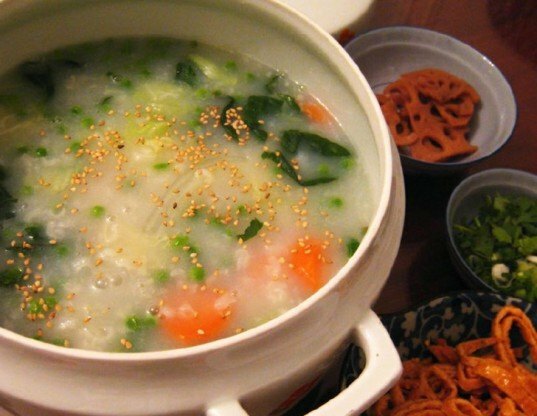 Thanks for the ideas for a deliciouss vegan congee! This is a great way to get an energy burst of protein first thing in the morning, and the amounts listed here will serve 2 hearty eaters. Feel free to halve the amounts if you're just cooking for yourself. 1 tablespoon oil or Earth Balance 1 teaspoon garlic powder 1 teaspoon onion powder 1 tablespoon soy sauce (or gluten-free tamari) 1 block of firm tofu, crumbled and pressed 1/2 a medium-sized yellow onion, diced 1/2 a large yellow, red, or orange bell pepper, sliced Salt, pepper, hot sauce 2 whole wheat tortillas or pita pockets You can also add half a teaspoon of turmeric if you'd like your tofu a bit yellowy, and feel free to add a tablespoon or more of nutritional yeast for "cheesiness". Toss the drained, crumbled tofu with the spices and soy sauce, and set aside. Heat your oil on medium-high, and sautee the onions and peppers together for 3 or 4 minutes. Add the tofu, turn the heat down to low, and continue cooking until the onions are golden/translucent and the peppers are soft. Season with salt and pepper to taste. (I also add tabasco or other hot sauce, but I like everything to be a little on the spicy side.) Warm your tortillas or pitas, fill with this mixture, and devour while warm. These are great with Daiya shreds, salsa, cubed avocado, fried potato, and shredded lettuce as well, so don't hesitate to add those as well if you have them on hand. 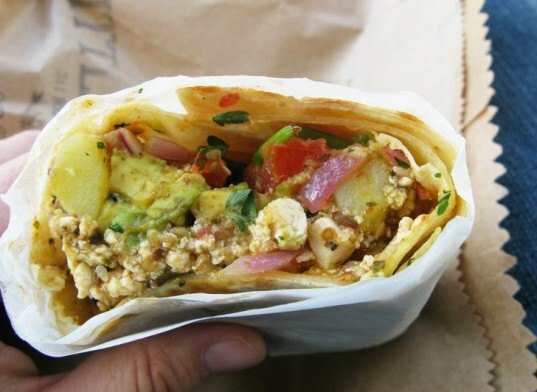 In lieu of a wrap, you can put together all the makings of your favorite burrito, and eat it out of a bowl. This way, you can adjust the fillings depending on what you have on hand and what you like more or less of, without having to worry about whether it'll come slorping out of the bottom of a tortilla wrap. 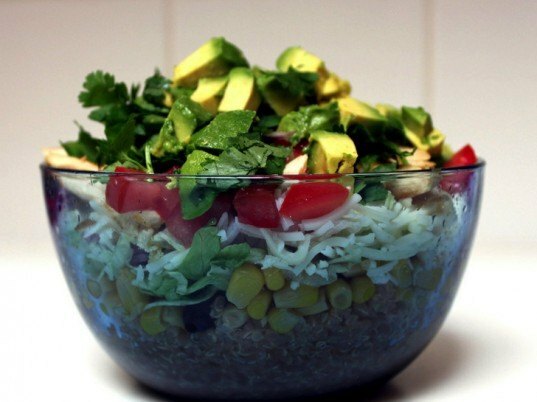 When assembling your burrito bowl, you can pick and choose from some of the following fillings: A base grain (cooked rice, quinoa, amaranth) Cooked sweet potato (strips, wedges, cubes, or mash) Beans (pinto, refried, kidney, black) Greens (lettuces, spinach, cilantro) Onions (sauteed, chopped green) Vegetables (corn, chopped tomatoes, sauteed peppers, jalapenos) Fried tofu, tempeh, or seitan strips Vegan sour cream Guacamole, or avocado slices Shredded vegan cheese Salsa Hot sauce Put a layer of your favorite grain at the bottom of your bowl (if desired—you can leave that out if you'd prefer), and then add in layers of whatever you like best. You can then either dig in to get deliciousness on every forkful, or toss it all together for a big messy bowl of scrumptiousness. 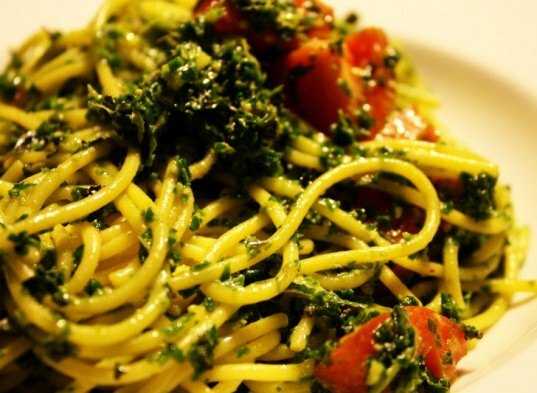 You can make your own pesto with any leafy green or fresh herb that you have in the house, with a bit of cooking oil, raw garlic, a handful of nuts, and if desired, a bit of nutritional yeast for "cheesy" flavor. Your basic pesto recipe for a few servings' worth will look like this: 1/4 cup nuts 2 loosely packed cups fresh herbs/greens (basil, spinach, arugula, kale, garlic mustard) 1 clove of garlic, depending on the clove's size and how fiery you want this A few pinches of sea salt, to taste Freshly ground black pepper Olive oil Puree all of these together in a blender, adjust the salt and pepper to taste, and then pour over your favorite pasta. If you like, toss in some halved cherry tomatoes, shredded spinach, or even 1/2 a cup of canned white beans that you've rinsed and drained. This is as great on gnocchi as it is on penne or linguini, and is amazing both hot and cold. Spicy pancakes with black beans and veggies in them? Yes, please! 16 oz can of black beans, rinsed and drained 1/2 a red, orange, or yellow bell pepper, chopped finely 1/4 cup of cooked corn kernels (frozen or canned) Zest of 1 lime 4 scallions, diced 1/2 a cup self-rising flour or vegan pancake mix 2 tablespoons non-dairy milk Egg replacer (enough to replace 2 eggs) 1/4 teaspoon of cumin 1/2 teaspoon of smoked paprika or cayenne pepper Salt Pepper Olive oil Add all ingredients but olive oil together, and use a potato masher to crush the beans slightly. Let sit for about 5 minutes, and adjust the flour/pancake mix as needed (it should be neither too liquidy, nor too thick. If you need to thin it out a bit, add water or more non-dairy milk). Heat a teaspoon or so of oil in a large, non-stick skillet, and once it starts hissing and spitting like an angry ferret, turn the heat down to medium and drop the batter in by the spoonful. I like to make this 1/4 cup at a time so they're bite-sized, but make whatever size you like. Cook until they're nice and brown on both sides, and serve hot. They're great on their own, or topped with vegan sour cream or guacamole. *Note: I actually like to add a bit of chopped mango to my batter instead of corn for sweetness, and then increase the spiciness with a bit of chopped chipotle. If there's a Chinatown in your area and you haven't yet availed yourself of the amazing foods available there, go acquaint yourself with it as soon as humanly possible. You can often find treasures like bunches of watercress or huge packages of bean sprouts or tofu for half of what standard grocery stores charge, and the produce will likely be fresher as well. To make this dish, just pick up one standard package of vegetable or mushroom ramen noodle soup per person, a package of semi-firm tofu, and an assortment of vegetables. Prepare the ramen according to the instructions on the package, and about a minute before it's fully cooked, toss in a big handful of veggies. Broccoli, shredded napa cabbage, bean sprouts and watercress all work well, and add extra flavor as well as nutritional value. 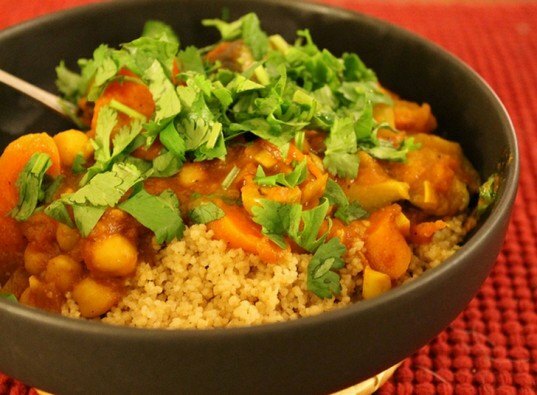 Serve with some fried tofu or seitan slices, and dig in! However you choose to spell this, it's a delicious, nourishing dish that only costs a few pennies per serving. Some recipes are fairly complex, but the simplest version just uses 6 ingredients. We always make a little bit more than we expect to eat for dinner so we can fry the leftovers as patties the next morning. *Tip: If you buy rice and dry lentils in bulk, you can save an insane amount of money on your grocery bills. 1 large Spanish onion, cut into paper-thin strips 3 tablespoons olive oil 1/2 cup dry lentils, washed and soaked for 20 minutes 1 teaspoon salt 4 cups water or vegetable stock 1 1/2 cups Basmati or other long-grain white rice More olive oil Heat the olive oil in a large skillet on medium-high, and add the sliced onions. Turn the heat down to medium and stir constantly until the onions are soft, brown, and slightly caramelized. Remove half the onions and spread on paper towels to absorb the extra oil. Add the the lentils, salt, a bit of extra oil, and the water (or stock) to the skillet with the remaining onions in it, and turn the heat up until the mixture boils, stirring occasionally. Add the rice, and once it comes up to a rolling boil, turn the heat down to low until the rice is cooked through and the lentils are tender. Remove from the heat, stir in the onions that you removed earlier, and season with salt and pepper as desired. This is great with a side salad or small bowl of lemony vegetable soup to cut the rich sweetness of the onions and lentils. 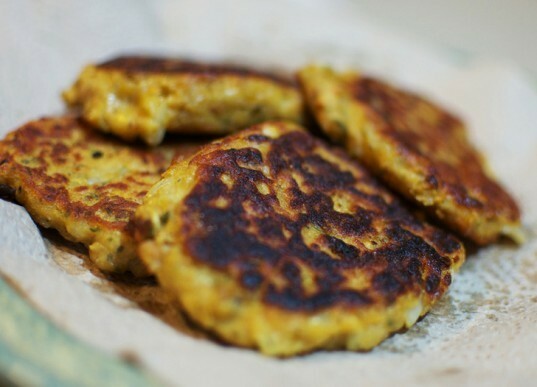 Also, if you have any left over, use it for breakfast the next morning: just pack it into patties, dredge in potato or chick pea flour, and fry 'til crispy. This was another one of my mainstays during college, as it can be made in countless variations depending on what produce is available/on sale at the time. Basically, you just add cubed/chopped vegetables into a stock pot and cover them with just enough vegetable stock to cover them, season it all, and let it simmer until all the veggies are fork-tender. You can mix and match any of the following: Onions Sweet Potatoes Yellow Potatoes Red, yellow, orange, or green peppers (just be careful with the green ones, as they can add a bitterness to the stew) Zucchini Eggplant Carrots Canned tomatoes Chick peas (canned or re-constituted) Coconut milk (or any other nut milk of choice) I tend to sautee the onions and peppers in a bit of olive oil before adding the rest of the veggies and stock, but it's entirely your call. Spices like cumin, garlic powder, cinnamon, cayenne pepper, and even garam masala can work beautifully in here, so use amounts that best suit your tastes. Season with salt and a splash of lemon or lime juice, and finish the stew by adding a handful of raisins, a couple of spoonfuls of nut butter, and if desired, a splash of coconut milk. Let this sit on the warmed stove—with the heat turned off—for 5-10 minutes to give the raisins time to plump up, and then serve. You can have this with rice or quinoa, or just on its own. It's absolutely divine, and even better for lunch the next day. Remember how we talked about Chinatown earlier? Chances are you can find some ingredients for Japanese cuisine there as well. A large bag of glutinous "sticky" rice will last you a long time, and with a few simple staples, you can create some fabulous onigiri meals. Just cook the rice according to the directions on the bag, and then determine what kind of filling you'd like in yours. If you like salty/sour tastes, you can use pickled radish or umeboshi plums, but don't worry about sticking to traditional fillings: feel free to experiment and decide what you like best. Although a little unorthodox, my favorite fillings are wakame salad (pickled shredded seaweed), tempura fried shredded sweet potato with vegan mayonnaise (sounds weird, but it's amazing), avocado, and spicy tofu cubes with chopped green onion. This filling is set aside until your rice is ready, and then all you do is make a patty of rice, hold it in one palm, make a small hollow in it, add a heaping tablespoon (or two) of filling, and then roll/pack it into a shape. 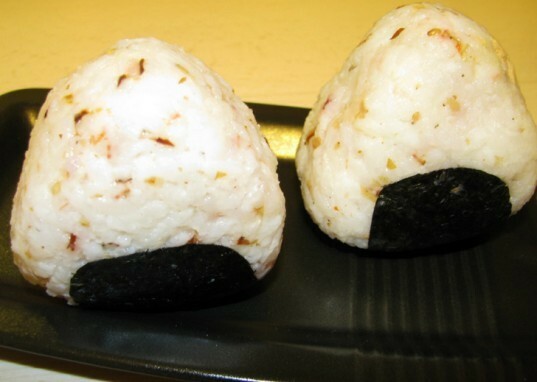 The easiest shapes to make onigiri in are balls or triangles, and you can either leave them as plain rice, or wrap them in nori. The former technique is great if you're eating them immediately, while the nori-wrapped ones are easier to take with you to work or school. If you're so inclined, pair these with some miso soup (easily portable in a thermos) to round out a full meal.